Footscray Park of 15 hectares (37 acres) was permanently reserved in 1911 as a site for a Public Park and Recreation purposes. The park's creation was largely due to the efforts of the citizens of Footscray who successfully lobbied the State Government and the Victorian Racing Club for the reservation of the park, and then contributed to its development through donations of labour and plants, with the local technical school building the lookout shelter. The park was designed by noted architect Rodney Alsop who won a competition for its design 1911. The plan was largely implemented by David Matthews, Superintendent of Parks and Gardens from 1916 until 1964, with the assistance of noted orchidologist, William Nicholls. The park features characteristic structures in an Edwardian style, in particular, rustic stone structures, lookout shelter, drinking fountains, arbours, bridges, ponds, and clover-shaped flower beds. The park also has an unusual and finely carved Platypus Fountain as well as a war memorial and a memorial to Henry Lawson. The design of Footscray Park fully exploits the northerly sloping site, providing external vistas to the Maribyrnong River, Flemington Racecourse and the city. The park is planted with many fine evergreen and deciduous trees, conifers, palms and Australian natives, including rare and uncommon species. Footscray Park is an important community recreation facility and hosts two of Melbourne's largest annual events, the Saltwater Festival and the Vietnamese Festival. Footscray Park is of historic, aesthetic, scientific (horticultural) and social significance to the State of Victoria. Footscray Park is historically important as an important Edwardian styled garden from the early twentieth century in Victoria. Designed in 1911 by the prominent architect Rodney Alsop, the majority of the layout and landscape features occurred under the direction of David Mathews from 1916 until about 1940. Mathews continued to develop and care for the Park until his retirement in 1964. The Park is important for its fine collection of garden structures, ornamental ponds, formal and informal path layout, and a rich plant collection. Footscray Park is aesthetically significant for its design excellence. The informal perimeter pathway, formal central path and steps and terraced garden layout constitute a particularly fine aesthetic response to the steep topography. An important facet of the design is the formal pathway whose axis leads to the river and the racecourse beyond. This park vista is among the finest in Victoria and incorporates a large circular bed with a rare Blue Hesper Palm and a long Wisteria pergola with a central dome of sophisticated design. The outstanding landscape character of the park is complemented by the planting themes of a deciduous tree avenue, palm collection, conifer plantation, water garden, Australian natives and arboretum. 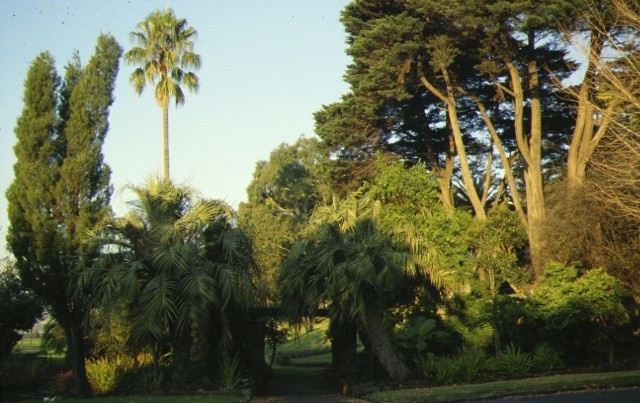 Footscray Park is important for its scientific (horticultural) achievement in the form of its outstanding plant collection of palms, trees and shrubs set amongst shrubberies and lawns. Significant plants due to their outstanding form, rarity and landscape value include: Brahea armata (Blue Hesper Palm), Angophora hispida (Dwarf Apple) [died 2005], Vitex agnus-castus (Chaste Tree), Ficus microcarpa var.hillii (Hill's Fig), Cupressus macrocarpa 'Hodginsii' [died Jan 2016], Ulmus glabra 'Exoniensis' (Exeter Elm), Melaleuca halmaturorum (Salt Paperbark), Quercus aff. stellata and the only two known Clerodendrum glabrum (Natal Glorybower) trees in Victoria. Footscray Park is socially important because of its long, close and continuing relationship with the citizens of Footscray who campaigned for its creation, contributed significantly to its development, and continue to use the park as an important community asset. Because the western suburbs of Melbourne lacked the public parks and gardens established during the 19th century in other parts of Melbourne, the establishment of Footscray Park represents a great achievement by the community. Footscray Park, Ballarat Road, Footscray, Maribyrnong City Council. 1. All of the land known as Crown Reserve RS 810 permanently reserved for Public Park and Recreation Purposes within the dotted line marked L1 shown on Diagram Number 600968 held by the Executive Director of the Heritage Council being part Crown Allotment 5, Section 15, Parish of Cut-Paw-Paw. T-7 Ulmus glabra 'Exoniensis' (Exeter Elm). The formation of Footscray Park from 1910 falls within the second phase of public park development in Victoria. This followed the creation of many parks and gardens in the mid to late nineteenth century throughout Victoria. Melbourne and many provincial towns became well known for their fine public parks and botanic gardens. Gardens developed in the early twentieth century corresponded with the suburbs of Kew (Alexandra Gardens), Camberwell (Maranoa Gardens and Becket Park), Box Hill (Wattle Park), Malvern (Central Park and Hedgley Dene), Essendon (Queens Park), Coburg (Coburg Lake), Reservoir (Edwardes Lake) and St Kilda (Catani Gardens). The Queen Victoria and Alexandra Gardens along St Kilda Road, Melbourne were also developed during this period . While in Geelong, the Eastern Beach facility was constructed and landscaped. In the City of Footscray, the Superintendent of Parks and Gardens Mr David Mathews took a keen interest in not only the development of Footscray Park, but also the Yarraville Gardens, Hansen Reserve, Simpson Street Reserve, Edwards Reserve (1947), playgrounds and recreation reserves . These plans show the layout and a few of the plans also include drawings of gateways and structures in an Edwardian style. The design of Footscray Park incorporates both formal and informal landscape themes and is influenced by the Arts and Crafts movement made popular by Reginald Blomfield and Thomas Mawson rather than English Landscape School of the eighteenth century and seen in parks and gardens of last century. In Victoria, Edwardian garden designs of the early twentieth century were influenced by Charles Bogue Luffman, Hugh Linaker and latter by Edna Walling. The garden design included main axial pathways, circular beds, urns and pergolas which where often constructed from split and dressed stone with large timber beams. Rustic elements and “Australiana” themes were also incorporated into the design. Formal garden elements and structures were promoted by the Australian architects, Walter Butler, Harold Desbrowe Annear and Rodney Alsop. Popular plantings during the Edwardian period included Conifers, especially Golden Cypress, Australian natives; Sugar Gum, Flowering Gum, Lily Pily, and Silky Oak, Palms, especially Phoenix and Washingtonia spp., colourful shrubs, some with purple or variegated leaves, and brightly flowering annuals. Amongst the larger growing deciduous trees, both Golden Poplars and Pin Oaks were common. The original reservation for Footscray Park was an area of 37 acres, 3 roods and 10 perches and was permanently reserved as a public park in 1911. A survey of the site in 1909 showed the site to be bare of vegetation except for a swamp which bisected the site between Ballarat Road and Saltwater Creek, now Maribyrnong River. The site was fenced with a post and rail fence along the north side and along the Ballarat Road frontage a plantation of trees was contained by a picket fence on the road side and a wire fence, from Nicholson Street to the Punt (Pioneer) Hotel . The land had been acquired by the Victorian Racing Club to control a prime vantage point over looking their racing carnivals and to prevent the establishment of noxious trades. In 1908-09 the VRC commenced plans to subdivide and sell the building allotments. Faced with its loss and following a campaign by the Advertiser newspaper, a group of businessmen and councillors negotiated with the VRC and State government to purchase the land for a public park. The land was sold at a reduced rate for 4800 pounds, each contributing a third to the purchase price . In 1910-11, the Council held a competition (prize 20 guineas) for park designs, which was adjudicated by William Guilfoyle, former Director of the Melbourne Botanic Gardens. The winning entry by architect and landscape designer, Rodney. H. Alsop was subsequently adapted by Footscray’s surveyor . In 1912, due to a shortage of funds the Footscray Council placed responsibility for the development of the Park in the hands of a ‘Citizens’ committee, the Footscray Park Beautification Committee. Mr James Jamieson, the Advertiser proprietor was appointed chairman, Mr Henry Mitchell, the Advertiser editor as secretary and Mr George Gordon as treasurer. The Committee solicited donations from private individuals and firms. Within a year the Committee had cut a 20 foot main avenue for nearly one-third of a mile, laid water pipes from Nicholson to Moore Street, planted almost 1,000 trees and shrubs, constructed irrigation channels, prepared garden plots and pathways and provided fifty seats . The Committee accomplished these improvements by working bees assisted by the Boy Scouts and the total outlay was only 152 pounds. The first meeting of the Committee was held on the 23 September 1913, and it was reported that Mr E. Campbell contributed 100 acacias for the Ballarat Avenue. Others donated trees and shrubs. The VRC donated two pavilions; one was converted to become the Byron Moore bandstand and kiosk and the former ambulance room became the curators residence . At its Annual Meeting in 1914 the Committee reported that; “Our first objective was to plant much needed trees, nearly 1500 specially selected trees and shrubs have been put in, .....We have in the park practically every known variety of wattle and eucalypti and a few of the finest of the better known specimen trees” . By 1916 the Beautification Committee had raised and spent almost 2,000 pounds, quarrying and replacing thousands of yards of bluestone with soil, planting 2,000 trees and shrubs, laying lawns and flower beds, and installing ornamental gates at the Nicholson and Moore Street entrances. In 1916 the Council assumed control of the Park and advertised for a ‘Working Landscape Gardener’. Mr David Mathews who had trained under Hugh Linaker at Ararat was chosen from 70 applicants . Symmetrically arranged around the formal path and circle are four stone pedestals and urns which were presented to the Council by Mr and Mrs T. H. Launder in 1918. 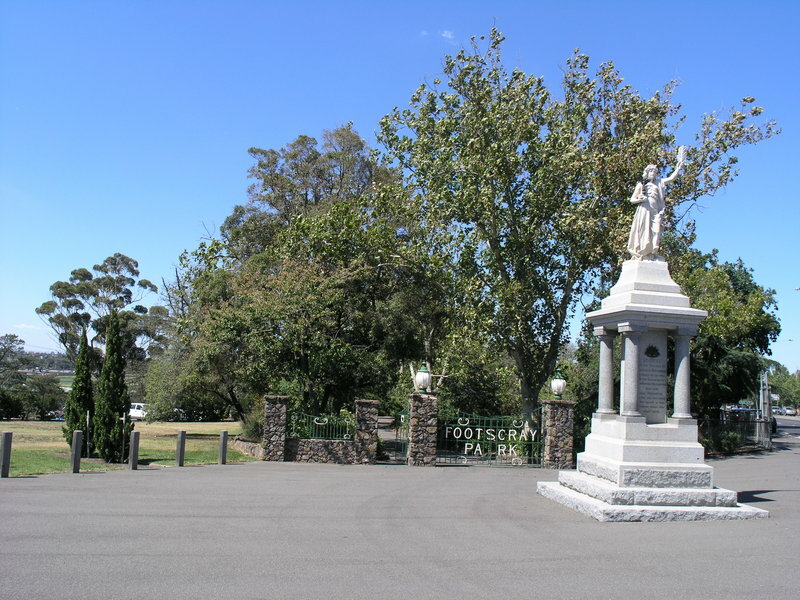 In 1919 the Footscray Residents Committee requested Council to erect a “Fallen Soldiers Memorial at Footscray Park and establish an Avenue of Honour along Ballarat Road. On Anzac Day 1921 the Soldiers’ Memorial, erected by the R.S.L. and claimed as ‘the only one in Australia’ built by returned soldiers, was unveiled before a crowd of 12,000 at Footscray Park . A “Soldier’s Tree”, an English oak was planted along Jamieson Walk just past the Technical School Shelter to commemorate the death of Eldred Lovett who was killed on 30 September 1917 . A public donation enabled the construction of a playground in 1925, and included a cement lined water play area and assorted play equipment east of the Moore Street entrance. In 1928 students from the Footscray Technical School designed and constructed a shelter and pergola at a point which provided commanding views over the river and racecourse . In 1927, William Nicholls, a bookbinder by training began employment as a propagator and plant classifier with the Footscray Council. Nicholls was a member of the Field Naturalists’ Club and from about 1920 he developed an obsessive interest in native orchids. His first research paper appeared in the Victorian Naturalist in December 1925, and about 100 articles were published, many with excellent line drawings describing new species. Nicholls a gifted botanical artist and orchidologist, is best known for his world acclaimed Orchids of Australia which was published in 1969, after his death in 1951 . Footscray Park became a popular location to watch the Melbourne Cup from ’Poverty Point’ near Nicholson Street and from ‘Scotchman’s Hill’ near the Pioneer Hotel. In 1920 a vast crowd gathered to see the aviator Sir Ross Smith arrive at Flemington Racecourse. In March 1928 some 40,000 watched Captain Bert Hinkler complete the first solo flight from England to Australia. At this time the Park had been greatly improved, a drive was constructed both sides of ‘Poverty Point’ and extensive tree plantings, - “of phoenix palms, English elms, Eucalyptus radiata and rostrata, swampy tea-trees and flowering cypresses” had been completed. Men working under the Mayor’s Unemployment Relief Scheme built the lower drive, planted trees at the western and eastern extremities of the flat and completed the major garden and lawn terraces between Nicholson and More Streets. Footscray conceived the Parkas not merely a municipal garden, but as a National Park, and was even described as a Botanical Garden to rival Melbourne’s . By 1933 the employment schemes enabled the T. B. Drew Memorial Walk, and the Thomson Water Garden with lily ponds, stone seats, bridges and arbours, timber seat shelters and the impressive Wisteria pergola. In July 1935, the Alfred Green Memorial Fountain, (“Platypus Fountain”) sculptured from Wangaratta granite was unveiled by Mrs J. Green . The 1938-39 Annual Report includes a number of photographs which show well landscaped grounds, mature trees and palms, lily ponds, vine covered pergolas and garden buildings. The widening of Ballarat Road saw the removal of a strip of land 16-24 metres wide and 720 metres long and resulted in the removal of the Byron Moore Rotunda, Sugar Gum plantation, entrance gates and the construction of new entrance gates at Nicholson Street, relocation of the War Memorial and new toilets fronting Ballarat Road. Mr David Reeves Mathews (1890-1969) retired in 1964 after 48 years of caring for Footscray’s parks and gardens. In 1965 he was made a member of the British Empire for his many public services, -to horticultural societies, youth clubs, tree planting and Field Naturalist societies, the State Nursery, and Victorian tourism . At the Footscray Park office there is a large collection of Glass Slides, numbering about 500 and held in timber cases. A lamp and slide holders also survive and is in working order. The slides record the development of Footscray Park, surrounding parks and gardens, street plantings, buildings, specimen trees and flowers. There are cross sectional drawings of flowers and other teaching slides. The glass plates are undated but the scenes of Footscray Park date the slides to the period 1930-1940s. One slide is a view of the construction of the upper path dated 1913, with a penciled 6 over the 3. Another slide shows a Rubber Tree in Ceylon, coloured by T W Cameron of Carlton. The slide of Grevillea oleoides was taken by Clarence L Lang. Two plates are of the well known Flowering Gum (Eucalyptus ficifolia) at the Metropolitan Golf Club.This same photograph is reproduced in Flowering Trees & Shrubs, by Harold Sargent of the Herald. This publication is not dated but at the end is a Flowering Calender prepared by Mr J T Smith, the Curator. Smith was curator of Melbourne’s parks and gardens from 1921 to 1943. 3. Playground surfacing - Specifications, requirements and test method AS 4422.